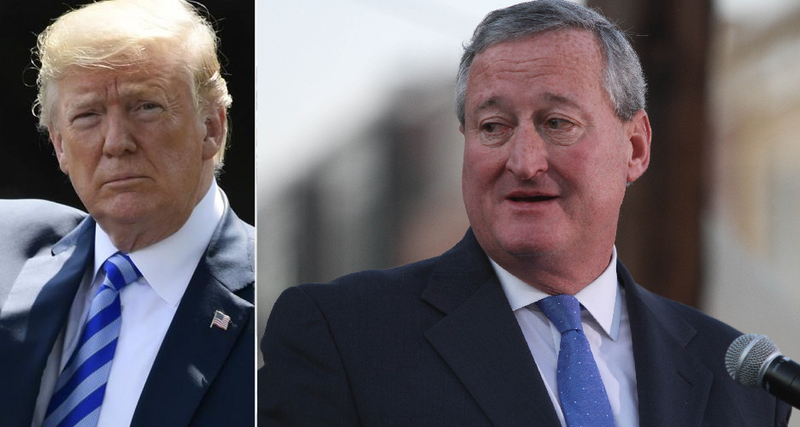 Philly mayor says Trump is "not a true patriot"
Philadelphia Mayor Jim Kenney hit out at President Donald Trump saying he’s “not a true patriot” and “a fragile egomaniac” after the president disinvited the Super Bowl Champion Eagles from the White House on Monday. Trump disinvited the Eagles from the ceremony set for Tuesday amid the national anthem controversy. Philadelphia Mayor Jim Kenney celebrated the Eagles, saying he’s proud of the team’s achievements on and off the field. “These are players who stand up for the causes they believe in and who contribute in meaningful ways to their community. They represent the diversity of our nation—a nation in which we are free to express our opinions,” he said. The Eagles reportedly wanted to send a small group of players but Trump tweeted late Monday, “The Philadelphia Eagles Football Team was invited to the White House. Unfortunately, only a small number of players decided to come, and we canceled the event. Staying in the Locker Room for the playing of our National Anthem is as disrespectful to our country as kneeling. Sorry!”, reiterating his opposition to hosting the team over politics. Eagles Brandon Graham, Malcolm Jenkins, Chris Long and Torrey Smith had already stated previously that they would not attend the White House ceremony. Previous Previous post: VIDEO: Can You Guess Who Said It, Donald Trump Or Barack Obama?